for the eighth time. Since we began sharing these figures with you in 2010, requests from governments for user information have increased by more than 100 percent. This comes as usage of our services continues to grow, but also as more governments have made requests than ever before. And these numbers only include the requests we’re allowed to publish. Over the past three years, we’ve continued to add more details to the report, and we’re doing so again today. We’re including additional information about legal process for U.S. criminal requests: breaking out emergency disclosures, wiretap orders, pen register orders and other court orders. We want to go even further. We believe it’s your right to know what kinds of requests and how many each government is making of us and other companies. However, the U.S. Department of Justice contends that U.S. law does not allow us to share information about some national security requests that we might receive. Specifically, the U.S. government argues that we cannot share information about the requests we receive (if any) under the Foreign Intelligence Surveillance Act. But you deserve to know. Earlier this year, we brought a federal case to assert that we do indeed have the right to shine more light on the FISA process. In addition, we recently wrote a letter of support (PDF) for two pieces of legislation currently proposed in the U.S. Congress. And we’re asking governments around the world to uphold international legal agreements that respect the laws of different countries and guarantee standards for due process are met. Our promise to you is to continue to make this report robust, to defend your information from overly broad government requests, and to push for greater transparency around the world. In a year in which government surveillance has dominated the headlines, today we’re updating our Transparency Report for the eighth time. 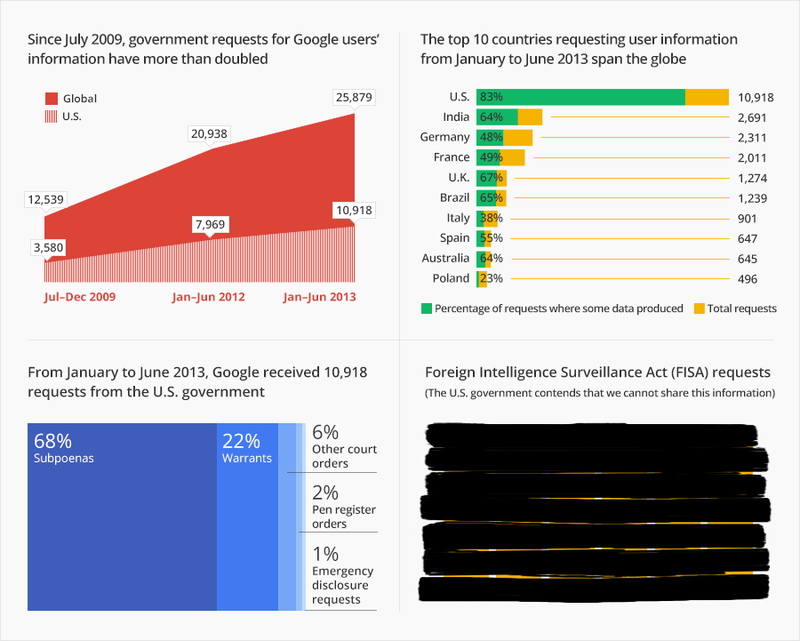 Since we began sharing these figures with you in 2010, requests from governments for user information have increased by more than 100 percent. This comes as usage of our services continues to grow, but also as more governments have made requests than ever before. And these numbers only include the requests we’re allowed to publish.